TV and radio personality and proud dad Phat Joe celebrates the birthday of his son Brooklyn by getting down and dirty at the Impi Challenge after a cable ski birthday bash. For the proud dad Phat Joe it seems like it was just the other day his son Brooklyn was in his terrible twos. Now he’s officially a teen, what better way to celebrate a journey into manhood than for father and son to accept a Top Billing challenge. First up is an adventurous cable water-skiing party at Blue Rock, which uses an overhead cable system and electronic motor wince to pull you around the water. Brooklyn and his friends give it a try and build their strength on chocolate cake before the next big event: The Impi Challenge. 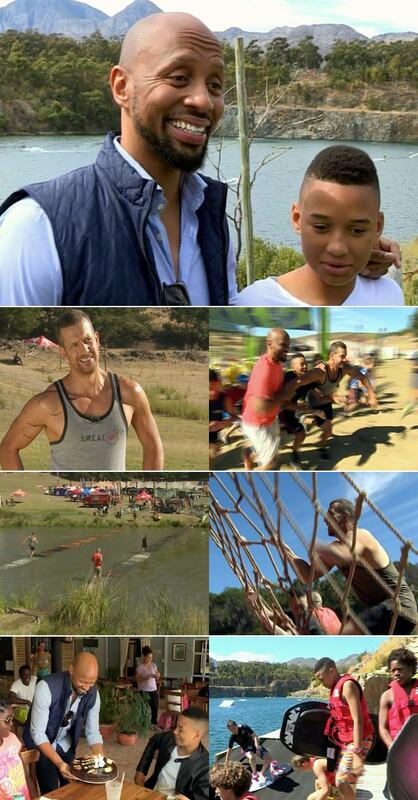 The father and son duo head for the IMPI challenge, a grueling outdoor obstacle course and the perfect place to meet Jonathan who has been helping SABC3 find new presenters along with Phat Joe. Jonathan has the muscles, Phat Joe can talk the talk and Brooklyn has youth on his side, which of the thee will prevail and cross the finishing line first? Find out in this action-packed edition of Top Billing, this Thursday evening 8:30pm on SABC3. Simba meets Angolan born, South African raised Daniel Joao, who recently took Heat magazine's ManWatch 2014 title. This week on Top Billing, our favourite leading men take us back to the Presenter Search that changed everything. Join Top Billing presenter Simba as he spends the day with Cameron in the gym to get his tips and techniques for keeping ahead of the game.